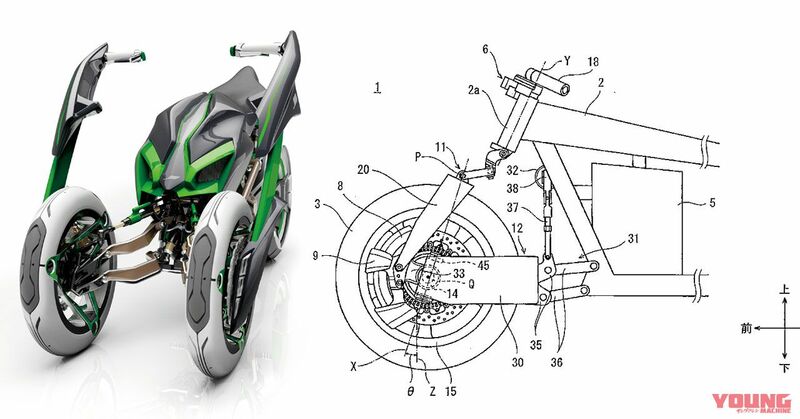 On 19th July 2018, a patent was announced that appears to be related to the super futuristic, realistic yet unbelievable Kawasaki “J” concept model. When we speak of Kawasaki hub-steering, it is the J and ZZR-X that come to mind. The “J” concept model that was exhibited at the 2013 Tokyo Motor Show as a reference exhibit applied battery control technology developed by Kawasaki Heavy Industries. It is a three-wheel EV (electric vehicle) that derives its power from a large-capacity nickel hydrogen battery (GIGACELL) that is able to charge and discharge quickly. The “J” concept has been developed to act as a new personal mobility machine that responds to differing riding conditions. It does this by adopting variable positions including a “comfort mode” that offers an upright body position for pottering about around town, and a “sports mode” that makes a forward inclination so that it is possible to enjoy faster riding. 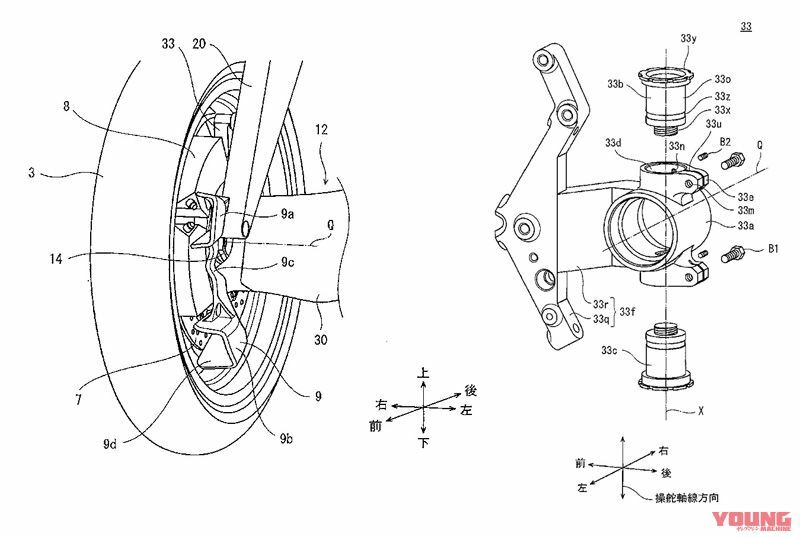 Based on the fact that the front two wheels are adopt a hub-steering system, we wonder whether the display of the patent on 19th July is related to the “J” technology?! It certainly reminded us of it, anyway. (Kawasaki Heavy Industries Vehicle steering wheel support structure) Regarding the vehicle steering wheel support structure hub-steering system, there has been an invention to prevent the knuckle joint increasing in size. Based on the illustrations above we are unable to say whether the front wheel resembles the “J” concept, but because the patent is regarding the knuckle parts we wonder whether there is the possibility it will also apply the use of two wheels. Based on the contents of the presentation we cannot clearly distinguish if a connected motorcycle will be produced, or if a “J” model equipped with a connected system will be produced. However, in the case that producing a bike with AI communication and variable riding positions is one of the aims, then we think the “J” concept is feasible. The next Tokyo Motor Show is a long way off in autumn 2019, but we hope to hear a fresh announcement then. 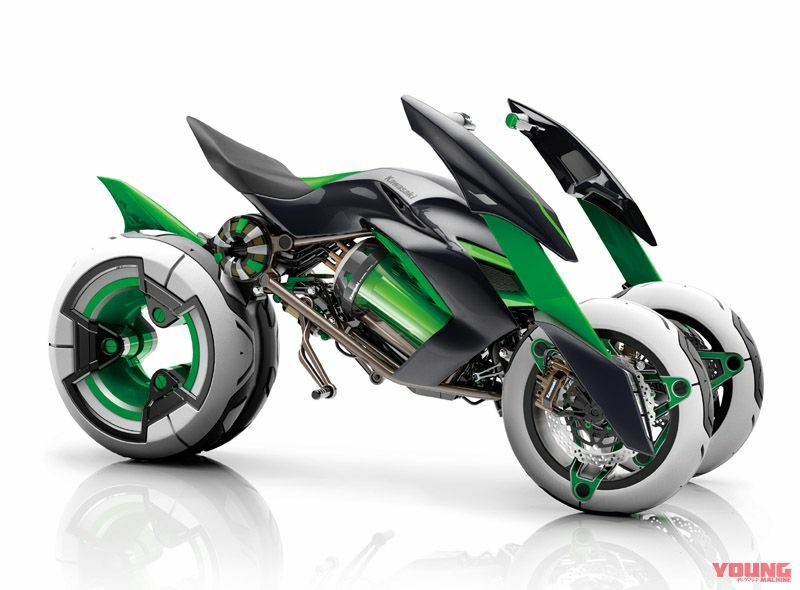 (Kawasaki J Concept model exhibited at 2013 Tokyo Motor Show) The “J300”, intended for use as a scooter in Europe, makes use of the battery control technology developed by Kawasaki Motor Industries, and gives us an insight to what kind of model might come in the near future if it gets the go ahead. 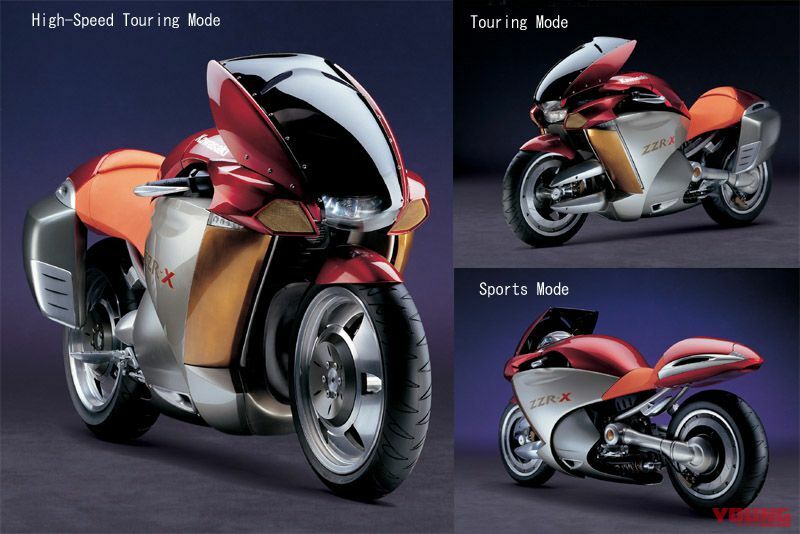 (Kawasaki ZZR-X Concept model exhibited at 2003 Tokyo Motor Show) This also has variable riding positions and application of hub-steering. (left) High-Speed Touring Mode: This is the standard mode fitted with pannier cases. It is possible to cruise at high speed on this setting. (upper right) Touring Mode: This allows the opening and closing of the back rest system from the standard mode. (lower right) Sports Mode: Handlebars and wind shield are set in a low position, making this the most appropriate mode for fast sports riding.